The year is drawing to a close quickly, which means it’s time to elect new officers! Yay! President: The president mainly runs meetings, and assists in planning the semester out along with the other officers. You will act as an AIGA rep and be responsible for informing chapter members on activities and maintaining communication. To run for president, you must have served on the AIGA officer board for at least ONE academic year OR a paid, active member for the past year. You also must be junior or senior status by next Fall (aka current sophomores). Secretary: Keeps minutes of all the meetings, email members about events and keep an up to date record on members and contact information (ideal for sophomores who wish to get their foot in the door). Treasurer: Responsible for collection of dues, handling accounts, and organizational funds. Also acts as head of budget proposals. Marketing Director: Responsible for the advertising of meetings and events, as well as AIGA as a whole. Works closely with GD and MM directors and assists in maintaining the blog. Must be willing to design posters if no one else wishes to make them, and able to update the blog frequently. So, that’s all. You can run for as many positions as you like, but you can only serve in one. I believe I, Ashley, ran for most of them last year. Serving on the board is an incredibly rewarding experience and it’s one I will never forget. Oh, and also… it’s mentioned that secretary is a sophomore status position. All positions are open to next fall sophomores (with the exception of President), in fact many of the past VPs have been sophomores! The wording of the positions sounds EXTREMELY terrifying, but just know that your other board members are there to help you. Most of us will still be around next fall, and able to help out for the first few weeks so you’re not left hanging! Be prepared to introduce yourself to the group, and just a simple statement as to why you want the position. All positions are OFFICIALLY OPEN. If one of us officers wants the same position as last year, we have to re-run as well. Hello Everyone:) Hope you all had a lovely break. 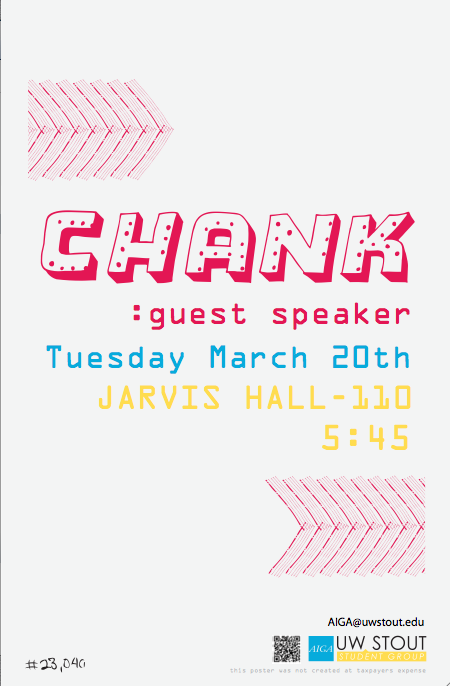 Get excited because we are having guest speaker on Tuesday March 20th @5:45 in Jarvis 110! Chank Diesel is a font designer based out of Minneapolis. Check out his website www.chank.com ! On March 6, 2012 we had the great pleasure of hosting Stout Alumni Kayd Roy as she shared with us her experience and advice on portfolios, freelancing, interviewing, and self-promotion. Kayd has a wide variety of professional experience and currently works at Target Corporation in Minneapolis in the Product Design and Development department. Ask for an informational interview: I really like your work, I’m a student in my ___ year. I would like to meet up and hear about your company and possibly talk about my work after. Would you be able to meet up _______? Tell family and friends that you’re looking for a job! Research–who are their clients? what’s the atmosphere like? Did they just launch a huge project? Dress-classy but show personality, know where you’re interviewing/what the atmosphere is like and dress accordingly, you’re a creative so show it! Understand what the project requirements are–size, budget, where they are getting it printed/what restrictions that has on you, what will be required of you? do they already have pictures or a logo? Lastly, she reminds us not to work for free! Thanks for coming Kayd! You had excellent advice and we enjoyed having you! BWBR is an architectural and Interior Design firm in St. Paul, Minnesota. 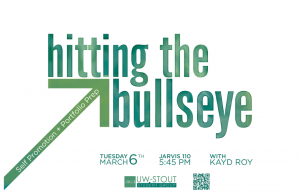 Stout alumni Don Thomas and Rachel Slette talked with us about what re-branding their company meant and how it touched in more ares than just a new logo. They began the re-branding process by wanting a new website. One useful tool they employed was “Appreciative Inquiries”. This is where they talked to a bunch of different people (clients, etc) and got their input about what BWBR as a company was doing right. This helped them highlight those things as they re-branded their company. First, they had to find a firm to hire to help make the changes and design the new brand. The chosen firm did research and had to be brought up to speed on who exactly BWBR was and what they stood for. They compared the current logo to other logos in the market and other similar-looking logos. They then presented six new logos (all in black and white as to not allow for bias). Don and Rachel suggested to us as designers to make sure we explained to our client how to properly use the new branding materials (which version of the logo to use in what instances etc). This is one area where they are continually running into issues with their new brand. They implement their new brand in all of their PowerPoint presentations, PDF presentations, large boards, soft wall panels, master plans, all administrative documents. This allows for unifying elements that all speak the same language and say “BWBR” to whoever views them. They stated that a brand needs to be flexible enough that it is easy to apply to various applications, but solid enough to always speak the same language. One thing that Don said that stood out to me was, “You have to think differently, because if you don’t, you won’t be able to offer anything new to your clients”. Rachel also had some good advice for us as we enter the crazy world of design. You have to be team oriented: you have to be a great communicator, work on teams, work under stress, embrace someone else’s idea and move it forward, be a good listener, manage expectations. You need a diverse range of skills sets and be comfortable adapting as you go: learning new programs and touching in different areas which you may not be familiar with. You need to learn to present your work effectively. You need to have clear communication with clients and co-workers. A lot of frustration stems from unclear communication. Ask others, “does this make sense?”. Make clear requests and set clear expectations for yourself and others–it’s not mean or rude; it makes things easier. We’re so thankful to Don and Rachel for coming to speak with us! They offered some great advice and insight.